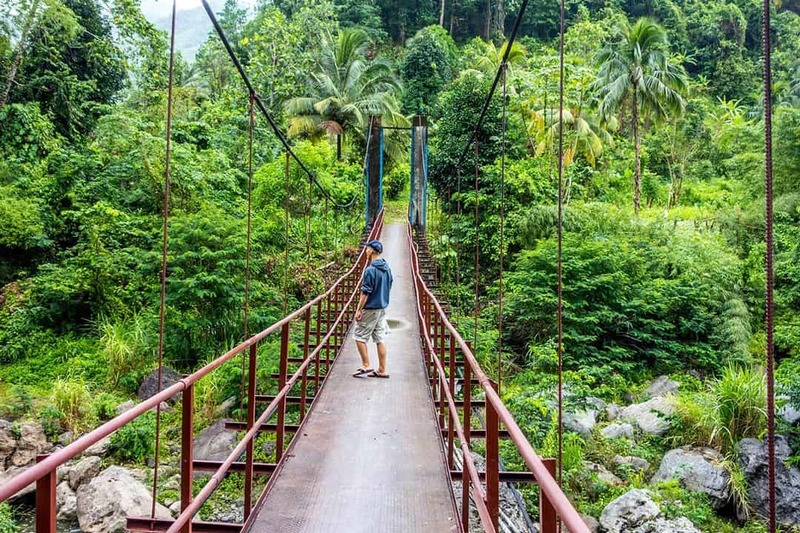 When people think of Jamaica, they don’t think of Jamaica as a backpacker destination. But you would be surprised to learn that Jamaica is actually a backpacker’s paradise. You can find cheap food and accommodations everywhere, and backpacking in Jamaica is completely possible! But we must admit that backpacking Jamaica on a budget isn’t easy, especially since the island caters predominantly to all-inclusive vacationers who are spending more in one day than we did in two weeks. However, using the tips below, you can spend an average of $50-60 USD a day, and enjoy Jamaica like any other backpacker destination. Unless you know the cheap spots to eat and stay in Negril, Mobay or Ochi, we recommend you spend no more than two days there… or just skip them altogether. These three areas in Jamaica are super touristy, crowded, and not to mention, everything is way more expensive there, than in the rest of Jamaica. Seven Mile Beach in Negril is free, but that’s about it. You have to pay an entrance fee to all the other beaches and attractions in those areas! And those fees aren’t cheap either. Besides, Negril, Montego Bay and Ocho are not true representations of Jamaica. 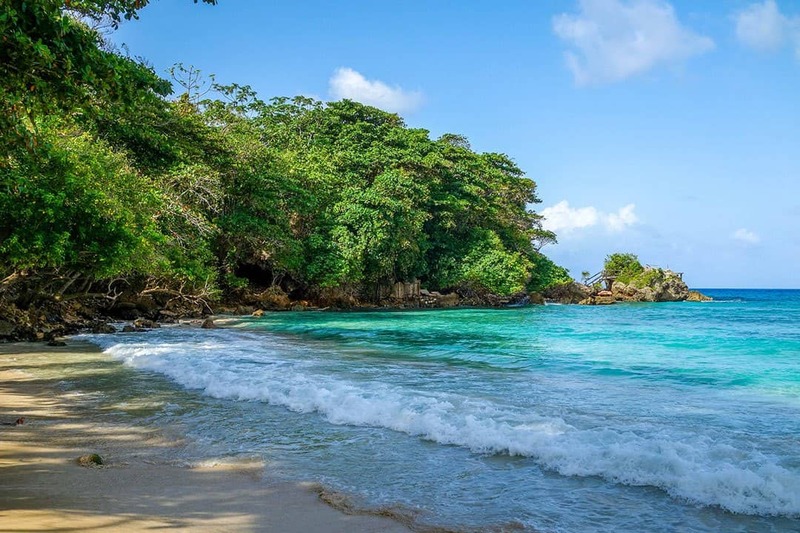 For a taste of the real Jamaica, head to Treasure Beach, Kingston, Port Antonio or inland to enjoy some of Jamaica’s natural gems. The best way to get around Jamaica is via public transportation. It’s cheaper, more efficient, and super fast, especially since all the drivers got their licenses from a NASCAR driving school! The two types of public transport are route taxis, which you will find throughout the island, and JUTC buses, which are predominantly found in Kingston. Both are super cheap. JUTC costs $0.90 USD within Kingston. A route taxi within city limits will cost $1-2 USD and if you want to travel between cities and towns, it’ll only cost you $3-7 USD. Believe it or not, resorts aren’t the only type of accommodation in Jamaica. There are many cheap places to stay in Jamaica, including budget guesthouses and hostels. However, many of them aren’t advertised on the internet. So it’s a matter of getting there and just walking around, which is part of the fun of backpacking in Jamaica. Jamaican vendors are known to be smooth talkers. They can easily talk you into paying 5 times the regular price! So having an idea of what things normally cost can save you a lot of money. The best way to do this is by asking other locals! Jamaicans are super friendly and helpful, so don’t be afraid to ask them how much something should cost. If you find prices to be way more than what the locals told you, try to haggle with the vendor or taxi driver. Haggling is part of the norm in Jamaica. The local beer, Red Stripe, costs $2 USD, a ¼ of jerk chicken costs $3.50 USD and a small weed bag costs $1 USD. But of course, expect prices to be much higher in Montego Bay, Negril, and Ocho Rios. 5) Avoid Eating Jerk Chicken and Seafood Everyday! 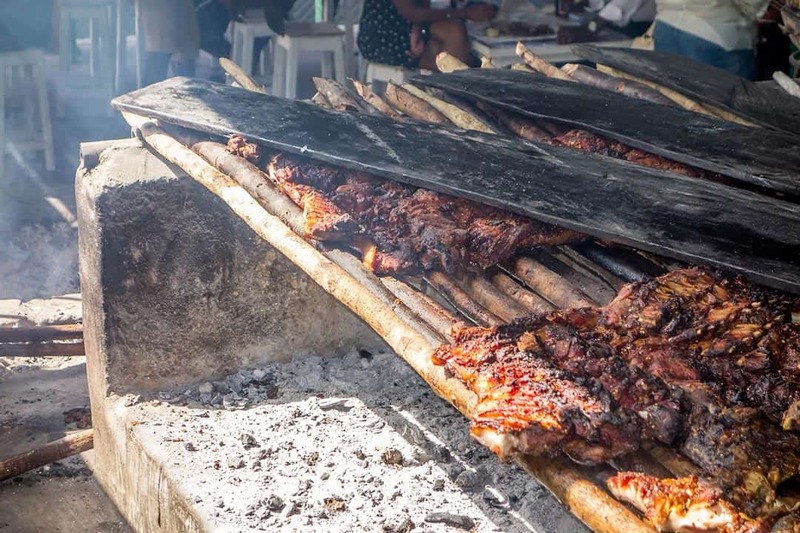 Jamaica is known to be the birthplace of jerk. But that doesn’t mean it’s cheap, it just means you can find it everywhere. Jamaican vendors know that tourists love jerk chicken, which means regardless of where you go, it’ll be expensive for what you get. ¼ pound of just jerk chicken can cost anywhere from $5-10 USD! Oh, and don’t expect seafood to be cheap either. Jamaica’s oceans are heavily overfished, so fishes are very hard to come by. Limit the amount of jerk and seafood you eat on a backpacker’s budget. Instead, fill up on other delicious Jamaican dishes like stew chicken with rice and beans ($3.50 USD) or Ackee and Saltfish (~$2.50 USD). Popular guidebook restaurants, like Scotchies, Rick’s Cafe, and 3 Dives are priced for tourists, so don’t eat there. Instead, head to local restaurants and shops you won’t find in your typical guidebook. Not only are they cheaper, they’re also tastier. Nothing can compare to big mama’s chicken stew. Popular attractions in Jamaica can be pricey, with most attractions starting at $20 USD and beach entrance fees starting at $5 USD. Yeah! You heard right. You actually have to pay to get into a lot of the popular beaches like Frenchman Cove or Doctor’s Cave. WTF? Fortunately, the best things in Jamaica are free. 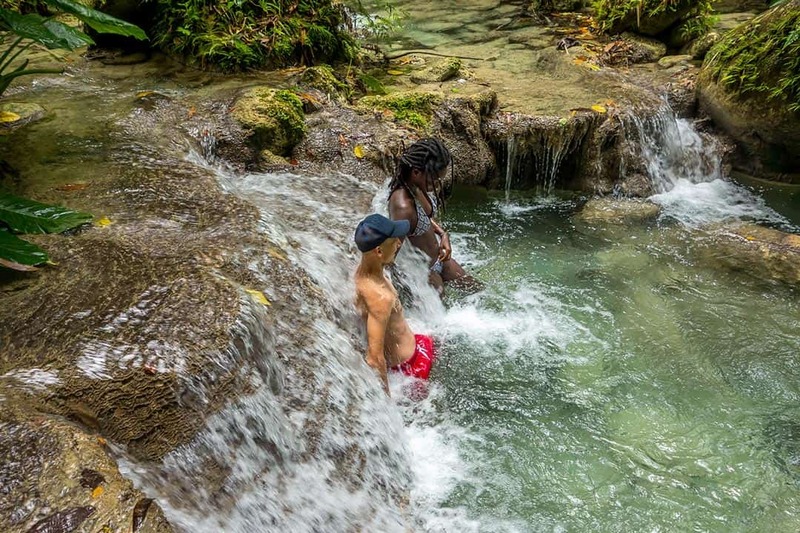 So throw away the guidebook, get off the beaten path and discover the real Jamaica. Traveling to Jamaica during the off-season (April-November) definitely makes life a lot easier and cheaper. Prices for accommodations are lower, vendors are willing to haggle even more, and attractions and cities aren’t bombarded with tourists. 9) Befriend a Jamaican or Two! Jamaicans are known to be blunt, honest, friendly, and generous people. They will always tell you like it is, including the prices of things, where to find the coolest spots or who cooks the best oxtail in town. Not to mention, if you are looking for something, they almost always know somebody that knows somebody that can get you what you are looking for. If you’re looking for an authentic Jamaican experience, there’s no better place to start than befriending some of the locals. Jamaican guidebooks are not meant for backpackers and budget travellers, especially since Jamaica’s main type of tourist is the all-inclusive vacationer. Due to this, those guidebooks won’t show you the real Jamaica. Use them with caution! From the Kingston airport, take JUTC bus #98 (big yellow bus with Jamaican flag on it) for J$120 (~$0.90 USD) into town. From the Montego Bay airport, take a route taxi downtown for J$100 (~$0.70 USD). Ben and I were able to explore Jamaica on $80 a day for the both of us. So I hope these tips make you pack your bags and visit an island you never thought would be backpack-able! Have you ever been backpacking in Jamaica? Leave us your comments below! Stop dreaming and start planning – Book your budget accommodation in Jamaica today. Hey, we are Ben & Jazzy, long-term budget travelers and the founders of Road Affair. We want to help you turn your travel dreams into reality, regardless of your budget. Follow us for comprehensive and useful budget guides, money-saving tips and inspiration for your next trip. Thank you so much for sharing your experiences. My girlfriend and me will visit Jamaica in September for14 days and we are really looking forward to making this experience. You were my first hit on google and maybe I will find some other reviews with other experiences, but a lot of people say that Jamaica is dangerous for tourists(backpackers). What experiences did you make? Do you have any recommondations in terms of “safe travels”? I am looking forward to reading from you! Hi, do you know how is the cheapest way to get out of Jamaica?